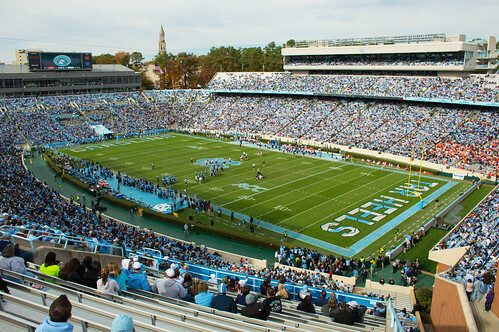 The University of North Carolina is the latest school to be caught with its players receiving improper benefits. According to the Associated Press, five unsealed search warrants revealed that former UNC Tar Heel cornerback Christopher Hawkins, who was arrested in May and charged with attempting to induce former Tar Heel and current St. Louis Rams DE Robert Quinn into signing a contract in 2010 by giving him money and helping him sell game-used equipment, acted as “an agent/runner.” This means he provided improper benefits to other players and set up meetings between them and other agents/advisers even though Hawkins himself was not legally registered as an agent. The players primarily involved in this investigation include Quinn, Denver Broncos DE Marvin Austin Jr., who started this whole investigation with a tweet five years ago, and former Browns WR Greg Little. However, many more players were alleged to have been involved with Hawkins. Back in 2010, 14 players missed at least one game because they were being investigated in order to determine whether or not they received improper benefits. Seven of them sat out the whole season. Quinn and Little were declared ineligible for the 2010 season. The investigation eventually led to the NCAA sanctions that UNC received in March 2012. As it turns out, the warrants also revealed that players received money, were paid to sign memorabilia, and were directed to other agents. Hawkins apparently lived in a house with former Tar Heel and Steelers RB Willie Parker. Inside the house were envelopes full of money with players’ names on them. Hawkins is also charged with basically attempting to do the same thing to UNC DB Jabari Price in 2013. His bond was initially set at $500,000 but was later lowered to $300,000 at a closed-circuit hearing from jail with Judge Beverly Scarlett.